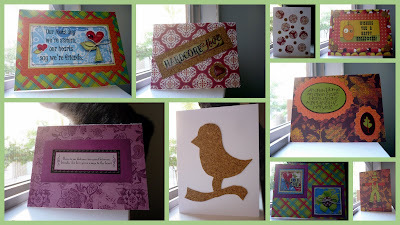 Last night, I received a box of new goodies I had ordered from Create for Less and got so inspired that I churned out 9 cards in 2 hours! One of my new materials is cork, which, when paired with my new 75% recycled paper cardstock, will be super eco-friendly. These will all be posted on my etsy shop this afternoon. Leave a comment and let me know which ones you like and don't like!